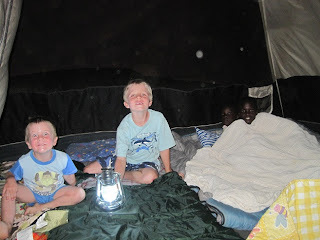 After much asking, Dad finally consented to a sleepover in the tent. It took him a while to warm up to the idea because all three kids and two friends were going to be involved and Dad got the privilege to be out there with them! Being the dry season, it was a nice breezy night which is good for keeping whatever malaria mosquitos might be out there. With only experiencing few interruptions to his sleep, Dad survived the night and the kids had a blast even though they woke up way too earlier for Mom and Dad's liking. Oh where was Mom during the night you ask? Nicely tucked away in bed...in the house! Well, there is no freeze in the weather here, just more like in my writing! The holidays are over and we have begun the grind of school again. I must confess I am not the most enthusiastic home school mothers. It is a daily struggle that I have to give over to the Lord, and still feel like I fail miserably. But everyday is new, right? God is faithful even when we aren't. I'm not good at New Year's resolutions, but my prayer is that patience and love will be on the list this year!